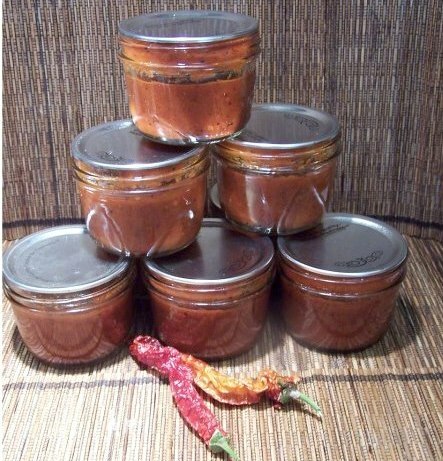 Enchilada Sauce in Jars - Canning Homemade! I have looked at six enchilada sauce recipes and there is a huge variation in the spices and flavors in all of the recipes. Tomatoes are the base but some have fresh chilis and others use chili powder. The goal was to find a safe recipe so that those that have been waiting to make up batches of this sauce would be pleased with the flavors. Below are three safe recipes, two of which are water bath recipes and the third is for a pressure canner. The difference is that the pressure canned recipes contain too many peppers which has to be heated to a higher temperature to destroy bacteria and the temperature of 212 degrees for boiling water just won't do it. I found out that my kitchen, from a leaking dishwasher, will be gutted for about three weeks for repairs and as a result I won't be able to delve into these recipes for pictures and flavor profiles. I only have two days and have so many other project to get done. When the kitchen is done I will be making the recipes but I wanted to share now since tomatoes will be coming in for some of us in May. Enjoy! Preheat oven to 450 degrees. Quarter tomatoes and place on baking sheets, lined with parchment preferred, salt and pepper to taste. Place Poblano peppers on top. Roast for about an hour, turning peppers as they blacken and blister. Remove peppers when all sides are blistered. Place peppers in a brown paper bag or ziploc. Allow peppers to cool and then peel. Add roasted tomatoes and peeled peppers to large stainless steel pot. Add remaining ingredients and use an emulsion blender to puree (or use a regular blender in batches). Fill sterilized jars leaving a 1 inch headspace. Add 1 T. bottled lemon juice to each pint jar and 2 T. bottled lemon juice for each quart. Wipe rim and add hot lids/rings. Pressure can at 10 lbs. for weighted gauge or 11 lbs for dial gauge for 50 minutes for pints and 60 minutes for quarts. Range-top method: Cover hot burner, either gas or electric, with heavy wire mesh. Place chilies on burner for several minutes until skins blister. Allow peppers to cool. Place in a pan and cover with a damp cloth. This will make peeling the peppers easier. After several minutes, peel each pepper. Cool and slip off skins. Discard seeds and chop peppers. Wash tomatoes and dip in boiling water for 30 to 60 seconds or until skins split. Dip in cold water, slip off skins, and remove cores. Coarsely chop tomatoes and combine chopped peppers and remaining ingredients in large saucepan. Bring to a boil. Cover. Simmer 10 minutes. Fill jars, leaving 1-inch headspace. Adjust lids and process in water bath 20 minutes for pints and 25 minutes for quarts at a full boil. 3. PREPARE boiling water canner. Heat jars and lids in simmering water until ready for use. Do not boil. Set bands aside. 4. Add tomato puree to a pot and get to a simmer. 5. ADD specified quantity of spice blend, 1 Tbsp lemon juice and 1/4 tsp salt, if using, to each hot jar (pint amount, double for quarts). 6. Ladle tomato puree into hot jars leaving 1/2 inch headspace. Wipe rim. Center hot lid on jar. Apply band and adjust until fit is fingertip tight.